Edward Snow's A Study of Vermeer, first published in 1979 and here presented in an expanded and elaborately revised version, starts from a single premise: that we respond so intensely to Vermeer because his paintings reach so deeply into our lives. Our desire for images, the distances that separate us, the validations we seek from the still world, the traces of ghostliness in our own human presence—these, the book proposes, are Vermeer's themes, which he pursues with a realism always in touch with the uncanny. As Snow traces the many counterpoised sensations that make up Vermeer's equanimity, he leads us into a world of nuances and surprise. A Study of Vermeer is passionate and visual in its commitments. Snow works from the conviction that viewing pictures is a reciprocal act—symbiotic, consequential, real. 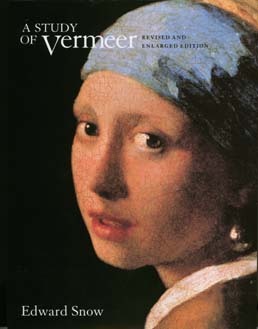 His discussions of Vermeer's paintings are conducted in a language of patient observation, and they involve the reader in an experience of deepening relation and ongoing visual discovery. The book has been designed to facilitate this process: over eighty illustrations, fifty-nine in color (including two full-page foldouts), accompany the text so that the details Snow illuminates will be continally in view. Here is a book to enthrall not only students of Vermeer, but anyone who feels the exhilaration of what Cézanne called "thinking in images." Edward Snow is Professor of English at Rice University. He has published interpretations of Velásquez, Bruegel, Marlowe, and Shakespeare, and has translated three books of Rilke's poetry.